When identifying material Corporate Responsibility Topics, we draw both on our internal, embedded risk expertise and the insights we gain from our stakeholder dialogue. In addition, we take into account the views of various standard setters on materiality, eg: reporting requirements, materiality definitions by sustainability rating agencies, multilateral discussions such as the UN Sustainable Development Goals, relevant academic research and regulatory developments. See details beneath the CR Map. In 2016, we carried out a comprehensive review of the key Corporate Responsibility Topics we are facing as a global re/insurer and, on this basis, developed a graphic Corporate Responsibility Map. We also maintain a formal process to identify emerging risks called SONAR ("Systematic observation of notions associated with risk"). This enables us to spot, at an early stage, newly developing or changing risks that may have an impact on our business, including risks related to environmental, social and governance (ESG) issues. 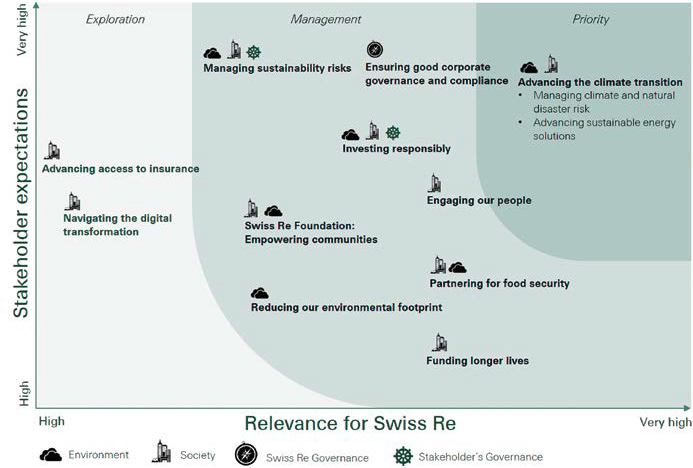 Launched in March 2017, the Swiss Re Institute plays a key role in our stakeholder dialogue. It incorporates successful Swiss Re brands, such as the sigma publication series and the Centre for Global Dialogue, our own in-house conference venue near Zurich. The institute further acts as a coordination point for research output from research-focused business lines within Swiss Re and from external partners. Our publications form another important element of our stakeholder dialogue: in 2017, we published approximately 13 new expertise publications and 17 new fact sheets. Complementing the insights we gain directly through dialogue with our stakeholders, we also evaluate and use data provided by specialised third-party organisations such as RepRisk (www.reprisk.com), Sigwatch (www.sigwatch.com), MSCI (www.msci.com) and Sustainalytics (www.sustainalytics.com) as well as the results of academic research. When identifying material Corporate Responsibility Topics, we draw both on our internal, embedded risk expertise and the insights we gain from our stakeholder dialogue. In addition, we take into account the views of various standard setters on materiality, eg: reporting requirements, materiality definitions by sustainability rating agencies, multilateral discussions such as the UN Sustainable Development Goals (see Our Corporate Responsibility topics, goals and achievements), relevant academic research and regulatory developments.